My first entertainment app "FickleCalc ver 1.0.0" was released. This is a promotional movie of powerful shopping list "mShopping ver 1.1.0". 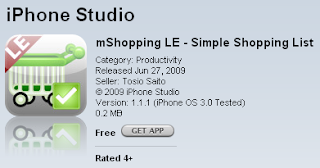 mShopping LE ver 1.1.1 (supports iPhone OS 3.0) released. 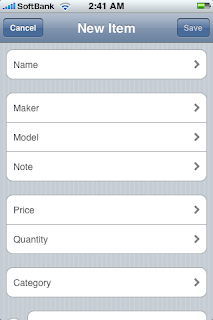 The simple shopping list "mShopping LE ver 1.1.1" updated version (supports iPhone OS 3.0) was released. Free application that supports English and Japanese, you can download it from App Store. Slightly change the layout of the screen. 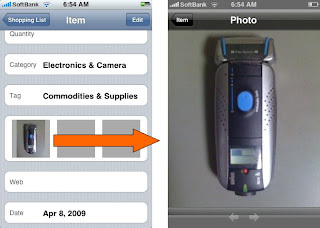 mShopping ver 1.1.0 (supports iPhone OS 3.0) released. 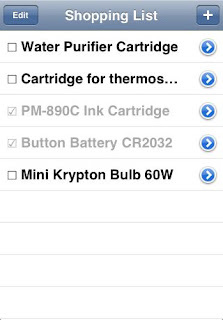 The powerful shopping list "mShopping ver 1.1.0" updated version (supports iPhone OS 3.0) was released. 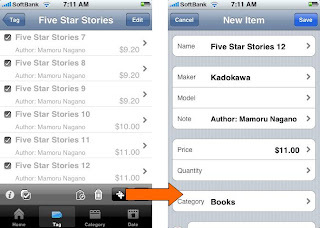 The application for iPhone and iPod touch that supports English and Japanese, you can buy it from App Store. 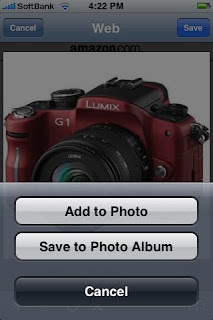 Change to display a thumbnail of the photo in the list screen. Change the layout of the detail screen. 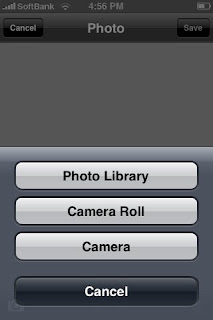 Move "Photo", "Web" to the top. Change to display an amount of each group in the grouped list screen. Change the title of the series registration screen to "New Item (Series)". mShopping is a powerful "shopping list". 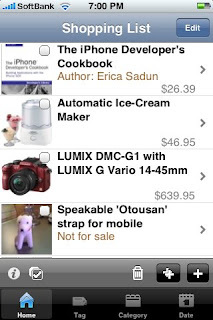 It possesses many functions not only for a simple "shopping list" but also for a "wish list" and "library catalog". From daily "shopping" to "collection management", please utilize it in various uses. Can register item photo up to 3 pieces. Can search for item information on the Web. Can register item image which searched on the Web. 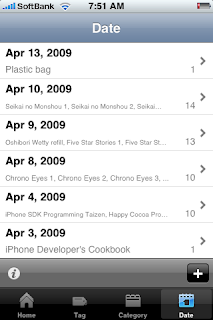 Can easily register items of series by series registration function. Can register tags and manage the multiple lists. Can manage items classified by category and date. Can manage purchased or non-purchase (check or uncheck). Can display only non-purchase (unchecked) items. Can delete all purchased (checked) items at once. 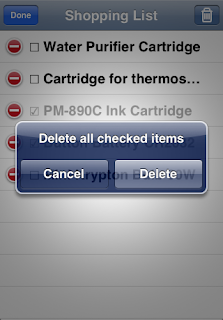 Can delete all items of the list at once. Can change tag or category of all items of the list at once. Even if you don't know the model number and manufacturer of item, you can register the photo, show it to the clerk, "This one, please" you can say. "The substitute edge of this shaver, please." If you register the item page that searched on Amazon, you can order it online anytime when the item is necessary. When necessary, order online immediately. When you register a series of novels and DVD, using the series registration function, you don't input the same information many times (author and title, publisher, etc.). You can register even voluminous series easily. Item name, maker, etc. are copied from the previous one. Then, simply change the volume number. 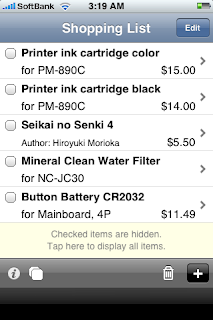 Tap a "+" button of the toolbar right-side end and add an item. A double "+" button in the left is series registration button. Copy the information of the item which registered just before that and register a new item. You can switch the all items display and only non-checked items display in turn when tap the second "checkmark" button from the left of the toolbar. 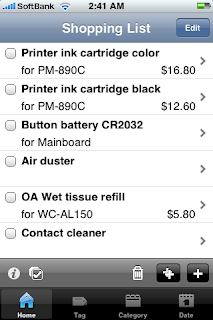 This is the screen on which items are grouped by tags. You can make the tag as many as you want. 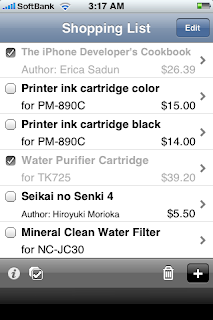 If you want to manage item groups or manage multiple shopping lists, you can use this feature. 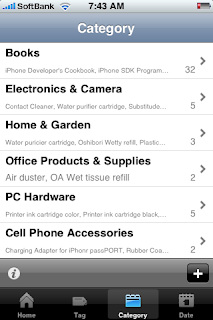 This is the screen on which items classified in categories. 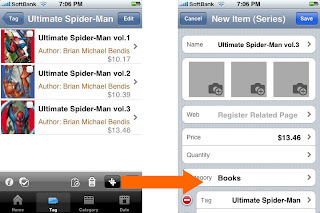 Unlike a tag, the category shows the classification of the item and chooses it from a list prepared beforehand. You can't add a new category and can't change the name of the existing category. 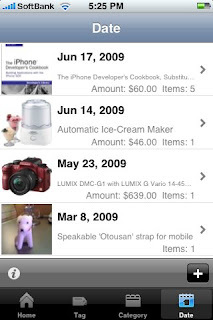 This is the screen on which items classified by date. By default, items are classified by the registration date, but you can freely change the date. You can register the publication date and manage your collection, or you can register the purchase date and manage your purchase history. Usage is up to you. 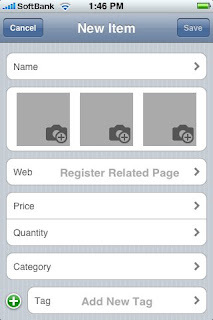 You can register item name, maker, model number, note, price, quantity, category, tags, photos (up to 3), related web page, date. 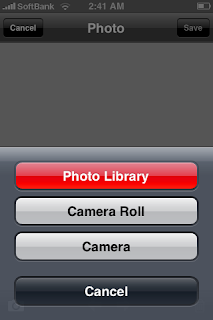 You choose an image from a "Photo Library", "Camera Roll(iPhone)" / "Saved Photos(iPod touch)", or take a picture with a built-in camera(iPhone only), and can register the photo of the item. You can register up to 3 photos per the item. 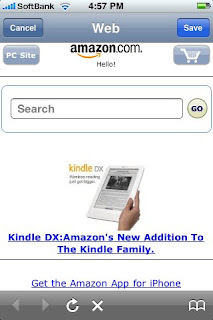 With a built-in Web browser, you can search information of an item in Web (Amazon, Google, Yahoo!). 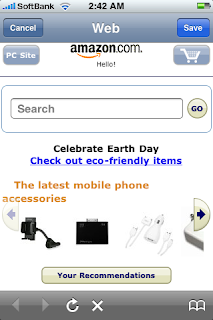 If you register the searched page as a related page, you can easily refer to later. You can register the searched image as a photo of the item. 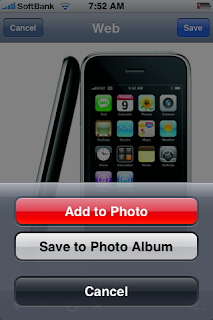 To register an image, tap & hold an image until a save menu is displayed. Supports backup and restore data. Supports additional fields by category. Supports grouping by the additional field. 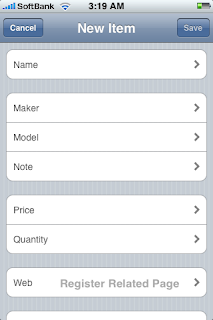 The powerful shopping list "mShopping ver 1.0.1" updated version was released. This update is only a bug fix. There are no new features. Fix the problem that may be rounding the decimal fraction of the price and quantity. Fix the problem that the change of the item name is not reflected by a list screen. Change usage of a red button of the action menu to the standard. Change the error indication of the Web view to alert box style. 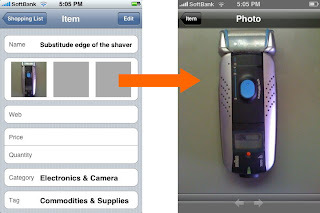 I upload a promotional movie of powerful shopping list "mShopping ver 1.0.0" to YouTube. mShopping LE ver 1.1.0 released. 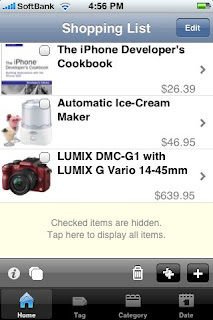 The simple shopping list "mShopping LE ver 1.1.0" updated version was released. Changed the icon design and the screen layout. Can see note, price, quantity as well as item name on the list screen. mShopping LE is a simple "Shopping List". 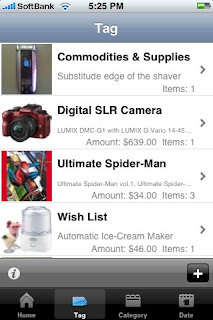 For "Shopping List", mShopping LE possesses only basic functions, but how to use is very easy. As a daily pretty good "shopping note", please utilize it. 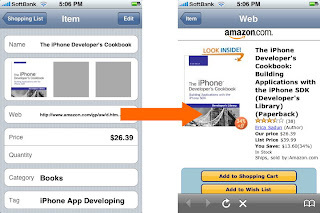 Tap a "+" button of the toolbar right-side end and add an item. ON/OFF of a check is toggled when tap the checkbox of the left of each line. 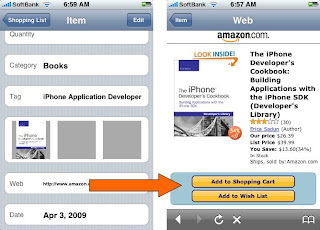 The detailed information of the item is displayed when tap the line of the item. You can register item name, maker, model number, note, price and quantity, related web page, date. 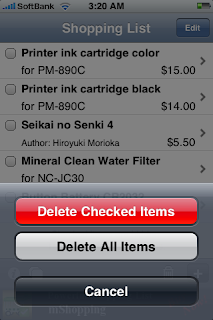 To delete an item from the list, tap an "edit" button of the top right corner of "Shopping List" screen and tap a "-" button of the item which you want to delete. 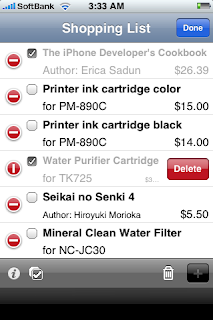 Tap the "Trash" button of the toolbar, you can delete checked items or all items of the list at once. Support backup and restore data. 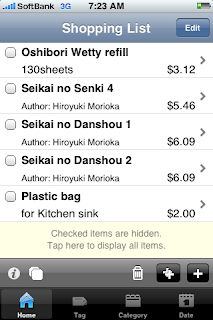 Powerful Shopping List "mShopping ver 1.0.0" released. The second application made by iPhone studio, powerful shopping list "mShopping ver 1.0.0" has been released. New version (ver 1.1.0) released. Click here. 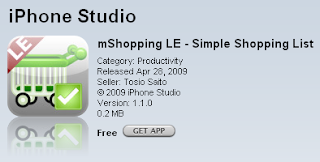 Simple Shopping List "mShopping LE ver 1.0.0" released. 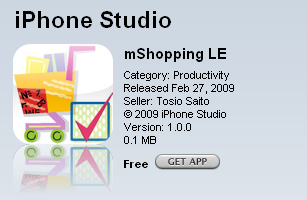 The first application made by iPhone studio, simple shopping list "mShopping LE ver 1.0.0" has been released. Add, modify, delete item of the list. Manage purchased or non-purchase(check or uncheck). Delete all purchased(checked) items at once. Tap a "+" button of the top right corner and add an item. 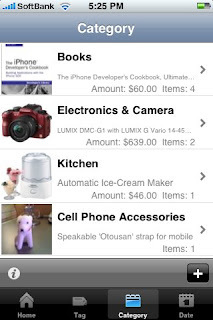 ON/OFF of a check is toggled when tap the line of the item. 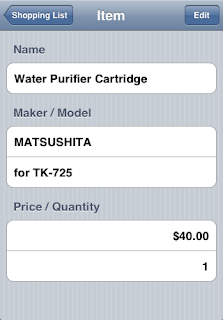 The detailed information of the item is displayed when tap the ">" button of each line right-side end. 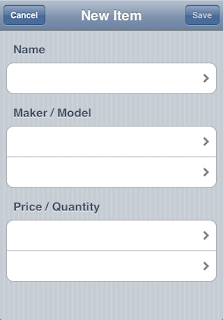 You can register item name, maker, model number, price and quantity. You can see the details of the registered products. 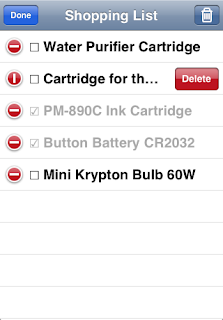 To delete an item from the list, tap an "edit" button of the top left corner of "Shopping List" screen and tap a "-" button of the item which you want to delete. Tap the "Trash" button displayed in editing mode, you can delete all checked items. Next version (ver 1.1.0), will be enhanced and changed the screen layout according to the paid version released soon. Please expect it. My First Application Coming Soon! Today, I submitted my first application to iTunes Connect(Apple) for examination. It will be sold in App Store in the beginning in March if I go smoothly. # It is free application. Here is a screen shot of it. 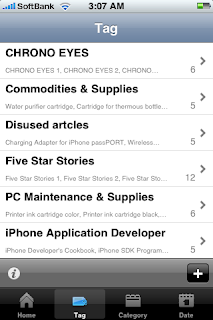 As can be seen, it is very simple "Shopping List" application. After official release as for the details. Copyright © 2008-2010 iPhone Studio All Rights Reserved.